Early this year Twinco replaced a 60,000-PSI waterjet-cutting machine with this Mitsubishi Suprema DX510 outfitted with a KMT Waterjet Streamline Pro 60-hp 90,000-PSI pump. The 50-percent increase in pressure allows the firm to process thicker material and increase cutting speed on thin work, while maintaining edge-and surface-quality tolerances. Perhaps the folks at Merriam-Webster should add to their definition of the word “versatile” some mention of the waterjet-cutting process. I come to this conclusion after speaking with those in charge at Twinco Mfg. Co., Hauppauge, NY. The very vertically integrated manufacturer primarily serves regional transit companies, fabricating automatic train stops, impedance bonds, relays, contacts and other electromechanical devices. Its 50,000-sq-.ft. facility houses CNC machining, stamping, molding, fabrication and assembly operations. Twinco’s vast range of capabilities has both Schatzes pledging to grow the company’s contract-manufacturing business (aside from its work for transit authorities) from five percent currently to 15 percent within the next two years. Twinco’s roots trace back more than 45 years, as a tool and die shop providing electromechanical components for equipment OEMs serving the railroad industry. In the 1980s it began to work more and more directly for the transit authorities (New York City, Chicago and others). Twinco’s latest vertical step to diversification: the addition of waterjet cutting. In 2005 the firm added a 60,000-PSI machine, coinciding with its move to its current location from a much smaller 22,000-sq.-ft. shop. This sampling of parts cut by Twinco on its waterjet machine displays the machine’s broad range of capabilities. A) A copper-alloy train-signal part waterjet-blanked from 1⁄6-in. 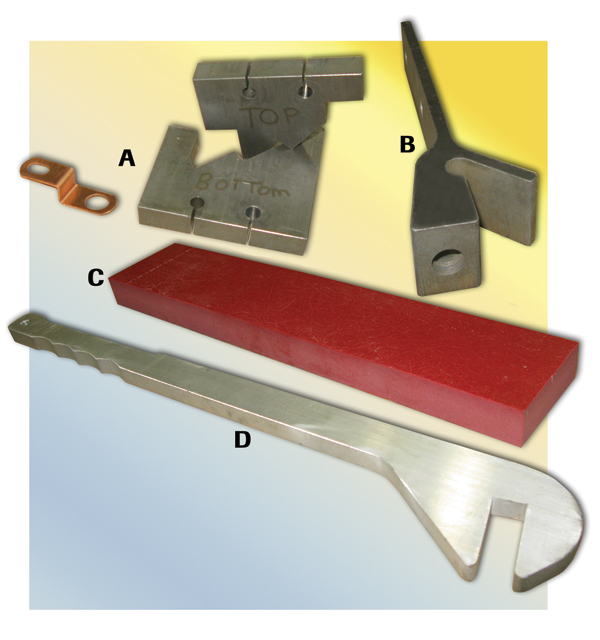 sheet and formed in a stamping press; and the set of tools (of prehardened 4140 tool steel) used to form the copper part, also fabricated via waterjet cutting. B) Twinco typically machines this part—a column clamp for elevator structures—from a casting. However, in this case, the flange is longer than usual and the order quantity was only 50, so Twinco waterjet-cut the part from 2-in. hot-rolled steel, then machined the holes. C) The red plate is 2-in.-thick GPO 3 fiberglass-reinforced polyester. D) Twinco waterjet-cut ¾-in.-thick aluminum plate to fabricate this wrench, used inhouse during testing of the train stops it manufactures. 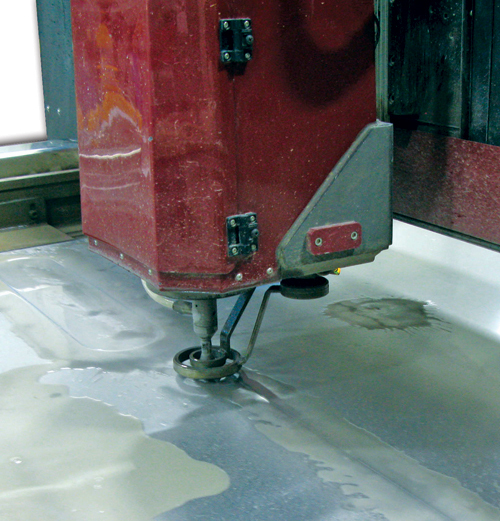 Early this year the firm upgraded its waterjet-cutting capabilities by replacing its 60,000-PSI machine with a 90,000-PSI machine, a Mitsubishi Suprema DX510 outfitted with a KMT Waterjet Streamline Pro 60-hp 90,000-PSI pump. The 50-percent increase in pressure allows the firm to process thicker material and increase cutting speed on thin work, while maintaining edge-and surface-quality tolerances. The Mitsubishi gantry-style cutting machine features linear-motor guides driven by brushless AC servo motors capable of rapid positioning speeds to 787 in./min., quite an upgrade from Twinco’s original belt-driven waterjet machine. Maximum workpiece size is 6 by 10 ft. Of Twinco’s diverse mix of workpiece materials, 75 percent of what it cuts on the waterjet machine is metallic, and half of that is stainless steel. KMT rates its 60-hp 90-KSI pump as capable of cutting 0.5-in. stainless at 18 in./min., 1-in. stainless at 7 in./min., and 2-in. stainless at 2.5 in./min. Maximum cutting speed on aluminum alloys: 55 in./min. for 0.5-in. plate, 21 in./min. on 1-in. plate, and 8 in./min. on 2-in. plate. According to Mitsubishi, ITC provides 360-deg. taper control by adding a 1- to 2-deg. mechanical tilt to the cutting head. This tilt compensates for the waterjet widening as it exits the focus tube. The firm notes that this allows a wall-straightness tolerance of ±0.001 in. per ½-in. of workpiece thickness. Every weekend i used to visit this web site, as i want enjoyment, for the reason that this this site conations genuinely fastidious funny material too.